Abebe Bikila – Ethiopian double Olympic marathon champion. 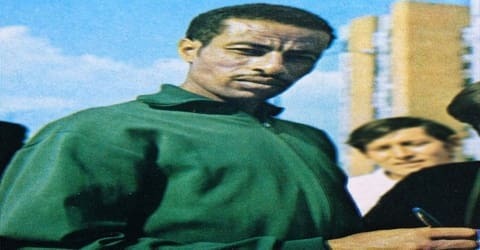 Abebe Bikila was a well-known Olympic marathon champion who participated in 15 marathons, winning 12 of them, was born on August 7, 1932, in the small community of Jato, then part of the Debre Berhan district of Shewa. He grew up in a typical village setting. He received some church education. In his youth, he was noted as a good swimmer, Guna player, a type of hockey played during Christmas, and a skillful horse rider. At the age of 17, he moved to the capital city, Addis Ababa, where he began a military carrier in the imperial bodyguard regiment. He was an Ethiopian double Olympic marathon champion. He won the marathon at the 1960 Summer Olympics in Rome while running barefoot, setting a world record. At the 1964 Summer Olympics in Tokyo, Abebe was the first athlete to successfully defend an Olympic marathon title, breaking his own world record in the process. He was a member of the Ethiopian Imperial Guard, an elite infantry division that safeguarded the Emperor of Ethiopia. Enlisting as a soldier before his athletic career, he rose to the rank of shambel (captain). In Ethiopia, Abebe is formally known as Shambel Abebe Bikila (Amharic: ሻምበል አበበ ቢቂላ). His successes and wins made him one of the greatest marathoners in the world. He is also the first man to win the Olympics marathon twice and the first black man from Ethiopia to win an Olympics medal. He also participated in International Paraplegic Games in Norway as a paraplegic after facing a car accident. The story of his life was a source of inspiration for many people. He was a pioneer in long-distance running. Mamo Wolde, Juma Ikangaa, Tegla Loroupe, Paul Tergat, and Haile Gebrselassie all recipients of the New York Road Runners’ Abebe Bikila Award are a few of the athletes who have followed in his footsteps to establish East Africa as a force in long-distance running. On March 22, 1969, Abebe was paralyzed as a result of a car accident. Although he regained some upper-body mobility, he never walked again. Abebe competed in archery and table tennis at the 1970 Stoke Mandeville Games in London, an early predecessor of the Paralympic Games, while receiving medical treatment in England. He competed in both sports at a 1971 competition for the disabled in Norway and won its cross-country sleigh-riding event. Abebe died at age 41 on October 25, 1973, of a cerebral hemorrhage related to his accident four years earlier. He received a state funeral, and Emperor Haile Selassie declared a national day of mourning. Many schools, venues, and events, including Abebe Bikila Stadium in Addis Ababa, are named after him. The subject of biographies and films documenting his athletic career, Abebe is often featured in publications about the marathon and the Olympics. Abebe Bikila Demissie was born in 1932 in the North Showa region of Ethiopia, in a village called Jato. 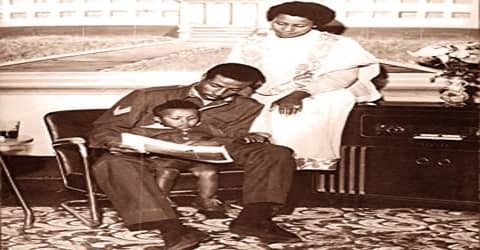 Abebe was the son of Wudinesh Beneberu and her second husband, Bikila Demissie. During the Second Italo-Ethiopian War, his family was forced to move to the remote town of Gorro. By then, Wudinesh had divorced Abebe’s father and married Temtime Kefelew. The family eventually moved back to Jato (or nearby Jirru), where they had a farm. To support his family, young Bikila joined the Imperial Bodyguard Squad of the Ethiopian Emperor Haile Selassie. His life took a turn when Swedish Coach, Onni Niskanen recognized Bikila’s athletic talent when he was sent to a government camp. Around 1952, he joined the 5th Infantry Regiment of the Imperial Guard after moving to Addis Ababa the year before. 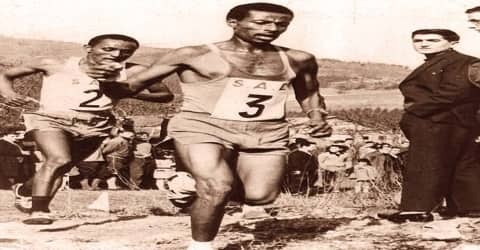 During the mid-1950s, Abebe ran 20 km (12 mi) from the hills of Sululta to Addis Ababa and back every day. Onni Niskanen, a Swedish coach employed by the Ethiopian government to train the Imperial Guard, soon noticed him and began training him for the marathon. 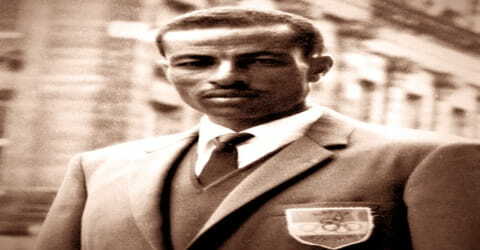 In 1956, Abebe finished second to Wami Biratu in the Ethiopian Armed Forces championship. Abebe Bikila began to prepare for the Olympics when he was 24 years old. Abebe Bikila married 15-year-old Yewebdar Wolde-Giorgis c. 1958. Although the marriage was arranged by his mother, Abebe was happy and they remained married for the rest of his life. Abebe and Yewebdar had several children. Their eldest son Dawit was born c. 1961 and their daughter Tsige around October 1963; both Dawit and Tsige became runners. In 1958, Abebe Bikila entered the National Armed Forces Championship marathon competition, won it and qualified to enter the Rome Olympic Games in 1960. The son of a shepherd, Bikila began running at age 24. He was little known outside of Ethiopia when he entered the 1960 Olympics and ran the marathon, barefoot, on the cobblestones of the Appian Way. Tied for the lead for much of the race, he broke ahead in the last 1,000 meters and crossed the finish line at the Arch of Constantine in 2 hours 15 minutes 16.2 seconds. 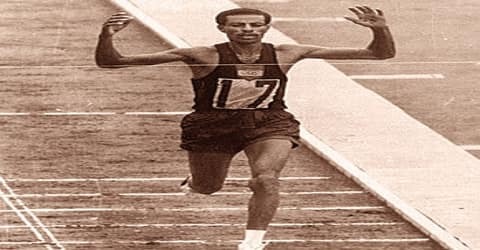 In July 1960, Abebe won his first marathon in Addis Ababa. A month later he won again in Addis Ababa with a time of 2:21:23, which was faster than the existing Olympic record held by Emil Zátopek. Niskanen entered Abebe Bikila and Abebe Wakgira in the marathon at the 1960 Rome Olympics, which would be run on September 10. In Rome, Abebe Bikila purchased new running shoes, but they did not fit well and gave him blisters. He consequently decided to run barefoot instead. Between 5 km (3 mi) and 20 km (12 mi), the lead changed hands several times. By about 25 km (16 mi), however, Abebe and ben Abdesselam moved away from the rest of the pack. Trailing by about two minutes at the 30 km (19 mi) mark were New Zealand’s Barry Magee, who was to finish third in 2:17:18.2 and Sergei Popov, the world marathon record holder at the time, who finished fifth. Abebe and ben Abdesselam remained together until the last 500 m (1,600 ft). Nearing the Obelisk again, Abebe sprinted to the finish. In the early evening darkness, his path along the Appian Way was lined with Italian soldiers holding torches. Abebe’s winning time was 2:15:16.2, twenty-five seconds faster than Ben Abdesselam at 2:15:41.6, and breaking Popov’s world record by eight-tenths of a second. Immediately after crossing the finish line Abebe began to touch his toes and run in place, and later said that he could have run another 10–15 km (6–9 mi). Running with soft strides; Abebe became the lone runner leaving everyone behind. He was already a favorite of the Japanese. 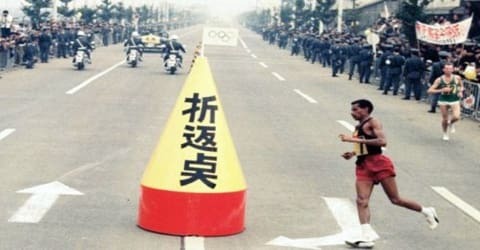 He won the Mainichi marathon held in Osaka in June of 1961. Estimated by the police over a million spectators lined up in the streets cheered him at every step of the way. He won the race with a record time of 2 hours 12 minutes 11.2 second improving his own record time in Rome. Once again, he crossed the track into the field and performed his stretching exercise. He dazzled and astounded the 80,000 spectators. Basil Heatley came second followed by Kokichi Tsuburaya of Japan in the stadium. Abebe had undergone an appendectomy 36 days before the Olympic. At the finish, he had shown no expression of fatigue nor convulsion or enthusiasm. Abebe ran the 1963 Boston Marathon, finishing fifth in 2:24:43, the only time in his competitive career that he completed an international marathon without winning. He and countryman Mamo Wolde, who finished 12th, had run together on record pace for 18 miles until cold winds and the hills in Newton caused both to fall back. The race was won by Belgium’s Aurele Vandendriessche in a course record 2:18:58. Abebe returned to Ethiopia and did not compete in another marathon until 1964 in Addis Ababa. Abebe won that race in a time of 2:23:14.8. In 1964, he participated in the Japan Olympics, even though he had not recovered from his appendicitis surgery, and won a medal for his country, setting a world record as the first man to win the double-Olympics marathon. He entered the 1968 Olympics in Mexico City but was forced to drop out of the marathon with a broken leg after 10 miles. A member of the Emperor Haile Selassie’s imperial bodyguards, Bikila rose to the rank of captain in the palace guard. An automobile accident in 1969 left him a paraplegic. On December 13, 1960, while Haile Selassie was on a state visit to Brazil, Imperial Guard forces led by Mengistu began an unsuccessful coup and briefly proclaimed Selassie’s eldest son Asfaw Wossen Taffari emperor. Fighting took place in the heart of Addis Ababa, shells detonated in the Jubilee Palace, and many of those closest to the emperor was killed. Although Abebe was not directly involved, he was briefly arrested and questioned. Mengistu was later hanged, and his forces (which included many members of the Imperial Guard) were killed in the fighting, arrested or fled. Abebe was the first athlete in history to successfully defend the Olympic marathon title. As of the 2016 Olympic marathon, Abebe and Waldemar Cierpinski are the only athletes to have won two gold medals in the event. For the second time, Abebe received Ethiopia’s only gold medal and again returned home to a hero’s welcome. The emperor promoted him to the commissioned-officer rank of metoaleqa (lieutenant). Abebe received the Order of Menelik II, a Volkswagen Beetle and a house. In a news conference after the event, Abebe predicted that he would win in the 1968 Olympic in Mexico City. Mexico City situated at a similar altitude to Addis Ababa. While training before the 1967 Zarauz competition Abebe hurt his leg. He competed in the race but failed to finish the course. He was sent to Germany for the necessary treatment by the Emperor; however, the discomfort to his leg was recurring during training. Very much confident, he arrived in Mexico City with the intention of winning and defending his Olympic title for the third time. He started in the leading pack running ahead most of the way. Many were certain that Abebe would win a gold medal. Nevertheless, his injury to his leg could not take the pain anymore. As the pain became unbearable, he decided to leave the competition. It was reported that he encouraged Mamo Wolde who was in the race, “I cannot continue running because I am seriously ill. The responsibility of winning a gold medal for Ethiopia is in your shoulder.” At the 15 kilometer mark, Abebe dropped out of the race. Mamo Wolde took the lead running alone with a little competition from the rest of the athletes and finished the race in the first place in 2 hours 20 minutes and 26.4 seconds. On April 21, 1965, as part of the opening ceremonies for the second season of the 1964–1965 New York World’s Fair, Abebe and fellow athlete and Imperial Guardsman Mamo Wolde, ran a ceremonial half-marathon from the Arsenal in Central Park (at 64th Street and Fifth Avenue in Manhattan) to the Singer Bowl at the fair. They carried a parchment scroll with greetings from Haile Selassie. The following month, Abebe returned to Japan to win his second Mainichi Marathon held in Shiga Prefecture. In 1966 he ran marathons at Zarautz and Inchon–Seoul, winning both. The following year, Abebe did not finish the Zarautz International Marathon in July 1967. He had injured his hamstring, an injury from which he would never recover. Abebe had begun to limp, and the 1966 Incheon–Seoul Marathon was the last marathon he ever completed. In 1969 while traveling back from his hometown Abebe had a tragic car accident. Realized by the Emperor that he could not successfully be treated at the local medical facility, he was sent to the Stoke Mandeville hospital in England. After eight months of treatment, he returned to Ethiopia in a wheelchair. Upon his return, he was welcomed by a cheering crowd. His physical limit never made him give up his love for the sport. His competitive spirits never diminished. 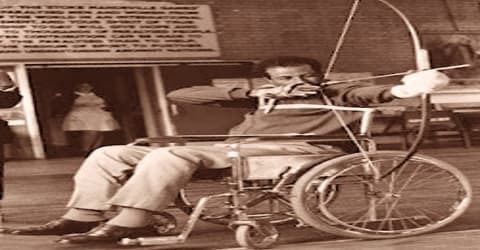 In 1970, Abebe began training for wheelchair-athlete archery competitions. In July, he competed in archery and table tennis at the Stoke Mandeville Wheelchair Games in London. The following April, Abebe participated in games for the disabled in Norway. Although he had been invited as a guest, he competed in archery and table tennis and defeated a field of sixteen in cross-country sled dog racing with a time of 1:16:17. In 1972, he was invited to the Munich Olympic Games as a special guest. He was received by standing ovation as he entered the stadium in a wheelchair. In remembrance of his fortieth birthday, a gala celebration was held at the Olympic village in the presence of athletes and officials of the organization. 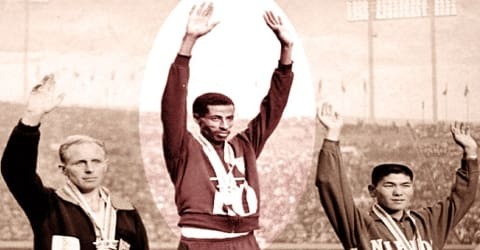 Abebe Bikila was the first African to win the Olympic marathon gold medal and is known as the first athlete to win two Olympic gold medals in the marathon. He wins his 1st Olympic gold medal in 1960 Rome Summer Games. A second Olympics gold medal in the 1964Tokyo Olympics. Abebe was the winner of many other marathons including the marathon in Kosice, Zarauz, South Korea, Otsu, and the 20,000 meters marathon in Copenhagen. 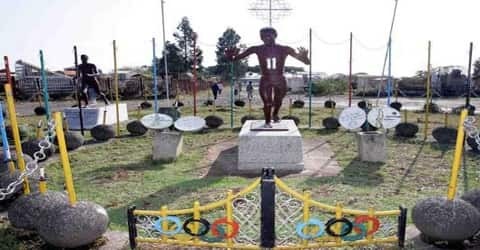 The Yaya Abebe Bikila Primary Village School was established by the Mendida community and a stadium is named in his honor in Addis Ababa. On October 25, 1973, Abebe died in Addis Ababa at age 41 of a cerebral hemorrhage, a complication related to his accident four years earlier. He was buried at the St. Joseph Cemetery. An estimated 75,000 mourners, His Majesty, members of the royal families, ambassadors as well as local and international reporters attended the state funeral. He is a national hero in Ethiopia, and a stadium in Addis Ababa is named in his honor. In late 1972, the American Community School of Addis Ababa dedicated its gymnasium (which included facilities for the disabled) to Abebe. 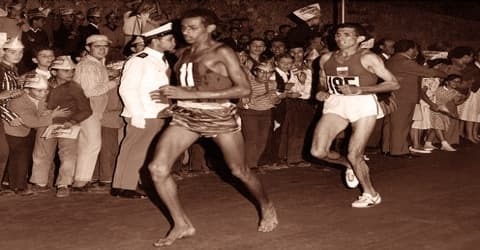 As a tribute to Abebe Bikila, Siraj Gena ran barefoot for the last three hundred meters of the Abebe Bikila’s Olympics Race in 2010 and won the same. The winner, Ethiopian runner Siraj Gena, ran the last 300 m (984 ft) of the race barefoot and received a €5,000 bonus. A plaque commemorating the anniversary is mounted on a wall on the Via di San Gregino, and a footbridge in Ladispoli was named in Abebe’s honor.